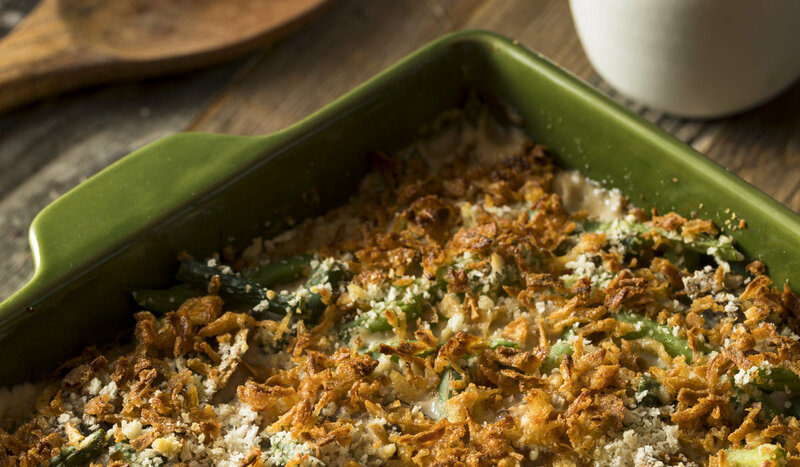 Thanksgiving always reminds me of my grandmother’s Green Bean Casserole. It was my most favorite dish of the year. 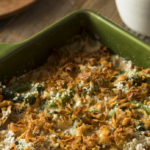 From the canned green beans to the French’s Crispy Fried Onions, it was warm and creamy, baked in a casserole dish, and served after just a bit of spooning to mix the ingredients. It took her less time to make than it took my grandfather to fall asleep in the recliner after dinner, but it left a lasting impression on my taste buds that I will carry with me for every Thanksgiving to come. The original Grandma Jones recipe called for just five ingredients, but over the years I’ve freshened it up a bit for a modern twist on a traditional classic. Cook green beans in salted water until bright green, and lay them into a baking dish oiled up a bit so that nothing sticks. In a saucepan, whip up butter and minced garlic, and then whisk in flour for about a minute to the base for the sauce. Pour in the chicken broth and cook for another few minutes. Add half-and-half or whole milk, turn the heat to low, and cook for 10 minutes. Now, turn off the heat and take all that amazing gooey, creamy, rich sauce and pour it evenly over the green beans. Add the coveted French’s fried onions, then add back in a preheated oven for 20-25 minutes. Cover for the last 10 minutes or so. This recipe serves six, but if you are anything like my family, you’ll need to double it because there’s nothing better than heating it up the next day.